My Year Of Star Trek: An Update on "Hailing Frequencies Open"
Yesterday afternoon, while working on a batch of illustrations in the library, I thought, "Oh, I should listen to some Star Talk Radio." 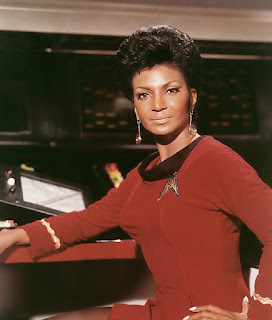 So I moseyed over to the site and found an interview with Nichelle Nichols about her experience with Dr. Martin Luther King Jr. Since I'd just written about that same experience, I couldn't wait to hear it. Unsurprisingly, it was awesome. How could an interview between Uhura and my favorite Nova Science Now host ever not be? What surprised me was that, about 45 minutes in, I was crying--in the middle of the library. Even though I just wrote about this the other day and even if you've heard the story a million times, go listen to it. It's powerful no matter how many times you've heard it. And, if you happen to be in a library, sniffling into your sleeve, don't worry about it. Just mention to the freaked out kid sitting across from you that you're listening to one of the most inspirational stories from America's modern history. You are being inspired, illuminated, and affected. That's what libraries are for, right? Thanks for posting about this! I'm listening to it now! found you through kate. we are a family of treckers. That's totally what libraries are for! I'm excited to listen to it!